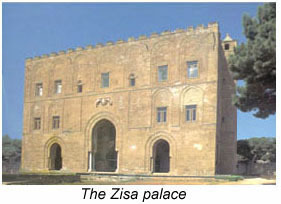 The Zisa is a 12th century palace constructed towards the end of the Norman reign when the Norman-Arab style of architecture had reached the peak of its development and sophistication. The name "Zisa" is the Sicilian for the Arabic "Al-Azizah," meaning "The Splendid." (The phrase survives in the Sicilian phrase "azzizatu," meaning "well-dressed.") This beautiful Norman palace certainly merits its name. The Zisa is set amidst some recently-restored Arab-style gardens. In the twelfth century, the Zisa was the main building of a royal park which also included the Cuba and the Cubola. This park was rather extensive, stretching at least one kilometer from the Zisa to the Cuba. In those days, this area was open land just outside the city gates. Today, the area where the park once stood is the lower Corso Calatafimi or Mezzo Monreale zone of Palermo. The park was known as the "Genoard," a Norman interpretation of the Arabic phrase "Jah'nat al-Ard," for "Terrestrial Paradise." The construction of the Zisa was begun in 1166 by King William I, who died that same year. The Zisa and its garden is usually open weekday mornings from 9 to 1 and then from 3 to 7 in the afternoon. On weekends, the palace is open on Saturday and Sunday mornings from 9 to 12. The Zisa is located in Piazza Gugliemo il Buono, near Piazza Camporeale (at the end of Via Dante). Located on Corso Calatafimi (in the Tukory barracks opposite Via Quarto dei Mille), the Cuba may be characterized as a less elaborate version of the Zisa, and it is not as well preserved. "Cuba" is the Sicilian derivation of the Arabic "Ka'aba," referring to a cube or square-shaped structure. It was built in 1180 by King William II to serve as a kind of summer-palace and main building of the royal gardens. The Cuba is about 30 meters long and 15 meters wide, with a height of about 20 meters. The building presently has no roof, and scholars disagree as to whether the Cuba once had a roof or dome that no longer exists, or whether it was built without a covering to give it an open-air effect. The Cuba epitomizes the classic style that so permeates twelfth century century Sicilian architecture. In the center of the Cuba there are remains of what possibly might have been e a fountain. There is a nook which has a semi-broken arch upon which there are inscriptions written in Arabic. The building is big enough to have accomodated a hundred people for a feast. The Cuba is open most weekdays from 9 to 1 AM and 3 to 7 PM. Sundays it is only open in the morning from 9 to 12. The Carthaginian Cemetery is located nearby. The Cubola, or "Little Cube", was built around 1180 as part of the garden complex that included the larger "Cuba" structure further down the Corso Calafatimi; both structures were built by the Norman King William II, who also ordered Monreale Cathedral built. The Cubola is sort of stone gazebo or kiosk for what was once William's personal pleasure garden. 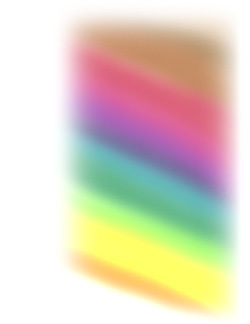 It is is a square structure, about three meters long on each side and about as high. It's distinctive feature is its red dome. The Cubola is located on Via Aurelio Zancla, a small side street off Corso Calafatimi near Villa Napoli. The Carthaginian Cemetery, or necropolis, dates from the 6th century BC through the 4th century BC,. Palermo was under Carthaginian rule at the time; in fact the city itself was founded by the Carthaginians themselves around 600 BC, probably upon an old trading post established by their Phoenician forebears around 800 BC. The cemetery is not large; it contains about seventy tombs, most of which are simply holes dug in the earth. The majority of the artifacts found in the graves have been removed, with most of them placed in Palermo's Archaeological Museum, where they can be viewed. The few artifacts that remain here, mostly terracotta pottery, utensils and jewelry that were buried with the dead, are found in several glass display cases located near the entrance to the site. There are two tombs here that are particularly interesting since the skeletons and artifacts contained in them have (by intent) not been removed in order to show visitors what they were like when first excavated. These two tombs can be viewed from an elevated walkway. Unless you are a real archaeology fan, the site might not justify a special visit. However, given its close proximity to the Cuba, off Corso Calatafimi, it is not out of the way. The Capuchin Monastery, with its unusual catacombs full of mummified cadavers, is a bit macabre, but worth a visit. Shortly after the construction of the present complex circa 1533 the Capuchin friars began the practice of mummifying and embalming the bodies of departed members of Palermo's bourgeoisie and nobility. This tradition was followed into the early years of the twentieth century, with the last "mummy" embalmed in 1920. After being embalmed, the corpses were hung up along the walls of the Catacombs, dressed in their finest clothes, where they still rest in peace. Among some of the more outstanding ones are a military officer in an 18th century uniform complete with a tricorn and the extremely well-preserved body of a little girl named Rosalia of about seven years old who had the distinction of being the last person to be thus embalmed here in 1920. You are not very likely to see anything like this anywhere else but in Palermo. The grave of Giuseppe Tommasi, Prince of Lampedusa, author of one of the best-known works of Sicilian Literature, The Leopard, is here. Thankfully, the body of the good Prince is not embalmed but is buried in the cemetery next to the catacombs. The Capuchin Monastery is open most days from 9 to 12 and 3 to 5.